Hmm, I'm intrigued. I think this blog will break into the advanced category, some time. Poor Justin . . . I wonder if that is a good thing. It would be interesting to see before and after site usage statistics for selected search terms. It will be helpfull for those who need some basic or simple results and also for those who need advance results. And wow. I got 21% Basic, 40% Intermediate, 38% Advanced for my name. Try for yourself. Very interesting indeed. 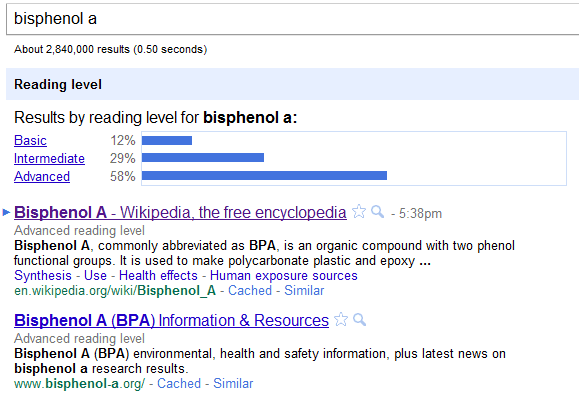 It's not only useful for finding search results but as a tool of interest. For example, I found that less than 1% of pages dealing with "advanced molecular design" are at a basic level, while less than 1% of pages dealing with "how to add" are at an advanced level. I think that the most telling thing about this article is that the "Justin Bieber" vs. "the" ratio for web pages is nearly 1:100. Yikes! In all seriousness, though, this really is helpful. If only it worked for other languages, I wouldn't have so much trouble trying to read foreign news articles I can't yet understand! This is something really great. Solution of the most annoying problem that I face more often like looking for some information finally got it but during reading I come to know that this is something belong to very high level and I can't understand it, such moments are really very killing.